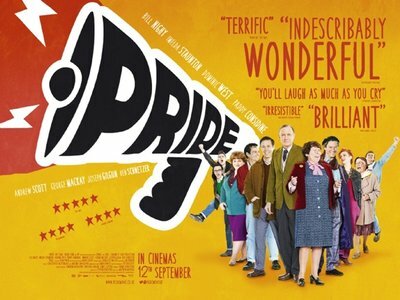 Last night I attended a private screening at the Lighthouse Cinema, Wellington, of the new British movie PRIDE. The event was organised in aid of next year’s Out In The Park festival in Wellington, which will take place in Waitangi Park on Valentine’s Day. The movie was simply amazing! I would even go so far as to say it may just be the best British movie I have ever seen. Boasting a stellar cast (Bill Nighy, Imelda Staunton, Dominic West), the movie is both hilarious and incredibly moving. I left the theatre smiling from ear to ear, yet incredibly humbled. PRIDE is set in 1984/85 and tells the true story of a London-based gay activist group called Lesbians and Gays Support the Miners and its efforts to support the striking miners of South Wales. The movie really brought home how incredibly fortunate I am to have grown up a generation later. The freedoms and acceptance I enjoy today were fought for by so many, many courageous individuals, all of whom I owe a debt of gratitude. Even though the underlying storyline is anything but funny and the movie touches on some pretty grim topics (AIDS, the coal miners’ strikes of the early 1980s, homophobia), it is by no means depressing. The screenplay is so beautifully written and the acting so superb that if PRIDE doesn’t have you laughing out loud, then nothing will! I cannot recommend watching this movie more strongly! 10/10. Five stars out of five. A+.